What are mitochondria and why are they important for motor planning in autism? Mitochondria are the energy production factories in our cells responsible for producing 90% of the energy in the body. They convert nutrients from our diet into energy in the form of ATP which “fuels” cellular function supporting growth and development. Children’s mitochondria come from their mothers and their are thousands in every cell (except red blood cells). They are the only organelle (little organ inside cells) that contain their own DNA! Mitochondrial function contributes to developmental delays in autism, Down Syndrome, Cerebral Palsy, Rare Genetic Disorders, Dyspraxia and Apraxia. What role do mitochondria play in autism symptoms? ATP is the fuel or “currency” in the body. Imagine you start making 50% less money. You would potentially have to budget and decide carefully which bills you were able to pay. The mortgage, being the largest bill, is the bill that would be the most difficult to pay. Look closely at the picture below. 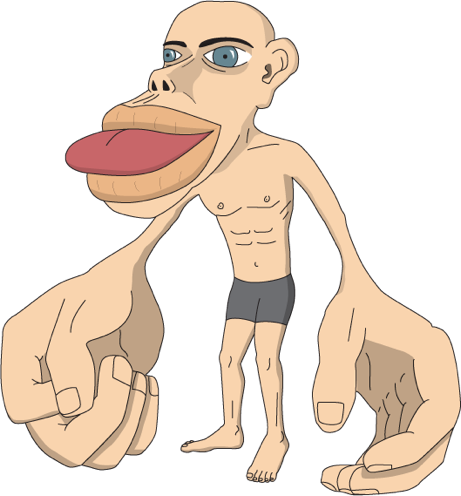 It is, as you may know, a homunculus which is a visual representation of the energy needs in the body. The largest parts need the most energy from the mitochondria to function properly. Decreased energy production results in slow down of the largest areas. And where do most children with autism struggle? Eye contact, verbal communication and often fine motor coordination. Improving mitochondrial function has been shown to improve language, social and cognitive skills for children with autism with resulting reduction in behaviours like headbanging and aggression. Everything we do in biomedical treatment is focused on protecting the mitochondria and improving mitochondrial function including dietary intervention and methyl B12 injections. Anything that depletes glutathione or damages the cell membrane can impair mitochondrial function including toxins, harmful microbes like lyme, clostridia and yeast overgrowth, nutrient deficiencies, stress. Dr. Naviaux’s landmark paper on cell danger response goes a long way to explaining what is happening in autism. Damaged cells and cell membranes result in a panic signal from the mitochondria; which disrupts cell function. Stopping the panic signal depends on improving glutathione status and when it stops, “autistic” behaviours like headbanging and aggression decrease, while language, social interaction and learning increase. How can biomedical treatment improve autism symptoms? Mitochondria need nutrients in order to produce ATP. Intestinal absorption of nutrients is important to support development. Children with autism experience constipation, diarrhea and other digestive problems more often than neurotypical children. This will result in lower nutrient status, decreasing the production of ATP. This is why dietary intervention in autism is so important! Mitochondria function optimally when children eat a diet that is rich in nutrients that they can absorb in a healthy digestive tract. Biomedical dietary intervention in autism removes grains and dairy from the diet improving gut function and nutrient absorption. This is the “paleo” diet because it is the food that humans ate during the Paleolithic era. During the Paleolithic era, humans grouped together in small societies such as bands, and survived by gathering plants, hunting and fishing. The best diet to feed children with autism is one that includes meat, fish, fruit, vegetables, nuts, seeds and eggs while removing all grains and dairy. Harmful microbes that feed on complex carbohydrates damage mitochondria. The shuttles that deliver fasts to the mitochondria are also damaged by these microbes living in higher numbers. Dr. Derrick MacFabe’s research on a clostridia model of autism highlights the impact of removing complex carbohydrates resulting in improved “autistic” behaviours. What is motor planning and how does it impact autism symptoms? Motor planning is how the brain comes up with a plan to coordinate movement. This is done by communicating with the motor and sensory systems. After the brain comes up with a plan it does a “test run” of the plan to check for flaws. The plan includes information from both the sensory and motor systems. The “test run” happens in another part of the brain that houses our memory. The brain checks with the memory centers to fine tune the motor plan. If all systems agree, a movement or a series of movements is occurs. The most difficult motor plans to create involve the small muscles in our body, called the fine motor skills. The eyes and the mouth are the finest of the fine motor skills, and require the most brain energy to create a motor plan that integrates sensory, motor and memory. Why is motor planning so complicated? Motor planning requires enough energy for the sensory systems, motor systems and memory stores in order to function optimally. Which is why it is so complicated. Let’s take a look at visual motor planning as an example. The brain uses 40% of its energy to process visual information. Both eyes take in visual information which is then processed, organized, analyzed and stored as data in the brain. This process is happening constantly and requires tremendous amounts of ATP. Children with autism make less ATP because of impaired mitochondrial function. As a result, this leads to a slow down in visual processing which sometimes looks like a decrease in eye contact. Other examples include side glancing, looking at objects closely or self-stimulating behaviours done in front of the eyes. These behaviours are an attempt to restore visual processing. Biomedical treatment addresses the slow down in processing by supplementing natural vitamin A. The vitamin A in cod liver oil is particularly helpful in restoring visual sensory integration. Supporting mitochondrial function with methyl B12 injections and dietary intervention improves overall motor planning (praxis) resulting in developmental gains including expressive language, eye contact, social interaction, cognitive performance and motor skills.